This year's Kangeiko was cold — 0º C when we started. The Kendo gods were truly smiling on us! In spite of that we had an excellent turnout, boosted by large contingents from MUKEN and for the first time Monash Uni Kendo Club. Kyohei had three of his students accompany him from Benalla. Members from Fudoshin and MBK rounded out the numbers. In all, throughout the day we had 25 kenshi attend. The focus of the day was shiai, with a particular focus on introducing new kenshi to some of the ideas and issues of shiai. 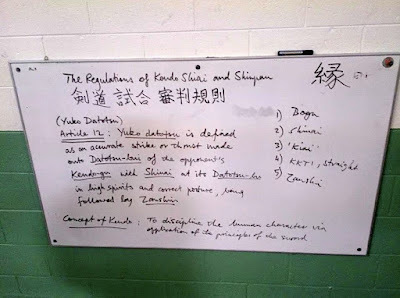 From looking at the definition of Yuko Datotsu, we practiced basics with a shiai purpose, looked at common strategies and mistakes at different levels of shiai, and then put that into action in three mini shiaijo. Each shiaijo had at least two experience kenshi overseeing the matches: a single shinpan officiating and another observer who was called on at the end to give verbal feedback. The beginner-kenshi all rotated through several matches with different opponents and were able to see how hard it is to reproduce basic, correct Kendo in a shiai situation. The observer-shinpan were able to give feedback on performance that was very helpful for those who had never competed before. We then did another round of shiai where the focus was on giving feedback to the shinpan—the shiaisha were let off the hook and able to just go for it. This was very interesting as the more experienced kenshi (who all had at least a passing experience at being shinpan) were able to cross-examine each other on decisions. One observation was how the definition of yuko datotsu sometimes needs to be modified for junior levels, specifically that the shinpan need to hold the shiaisha to the best that they (the shiaisha) are capable of, given their standard of Kendo. In other words it's no good expecting the perfect, clean ippon from someone in their first competition. 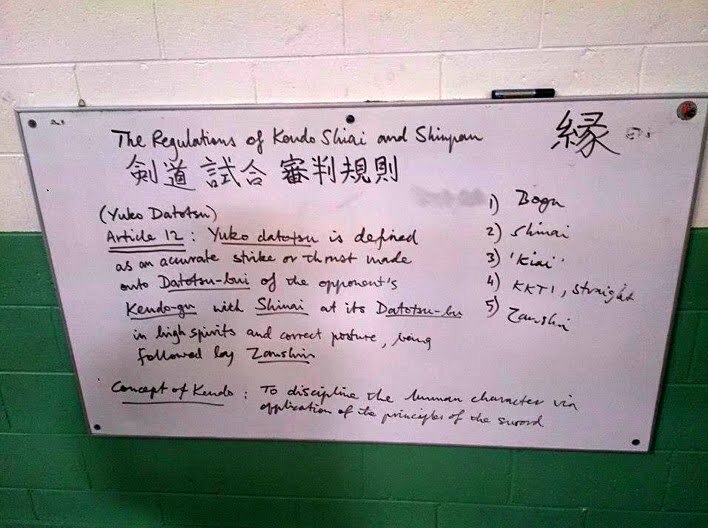 We spoke about how not only article 12 of the Regulations for Kendo Shiai and Shinpan, but also the Concept of Kendo should be at the heart of all shinpans' decisions. Finally the shinpan themselves put on men and did many rounds of shiai for the benefit of the beginner-kenshi. This was very instructive because it gave a good example of what they can aim for in their Kendo. We also stopped and analysed individual ippon, as well as cuts that weren't quite ippon, which I hope clarified things for the less experienced kenshi. We finished with an hour of jigeiko which seemed to pass all too quickly. The day ended with no major injuries and was a good way to finish off the term, as well as celebrate the winter solstice! Next term we will be hosting a new beginners' course, so things will go back to basics for a while. To all the non-NSKers who attended, thanks for making this Kangeiko one of the best ever. To all NSKers, especially those who stayed the whole day, well done and see you on you 20 July. PS - some more pics on the VKR's Facebook page (it's public, you don't have to be on FB) courtesy of Kenji.